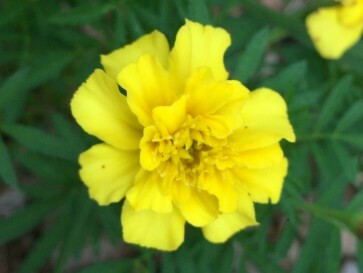 Sunny yellow double marigold blooms on compact plants. This adorable sunny yellow double marigold blooms on compact plants. Lemon Drop adds a bright spot of color to the front of the bed, patio containers, and window boxes. In the vegetable garden, it takes up little room, attracts bees to help pollinate your veggies, and may reduce soil nematodes. Fairly drought tolerant once established. Deer resistant and blooms until frost.